The spring meeting of the Romantic Circles Pedagogies Reading Group took place on 19th March. Participating were Holly Hirst (Manchester Metropolitan University), Kirstyn Leuner (Santa Clara University) and Dana Van Kooy (Michigan Technical University) looking at Mary Shelley’s 1833 tale ‘The Mortal Immortal’. The tale is narrated by the eponymous ‘mortal immortal’ Winzy, who tells the tale of his own apprenticeship to Cornelius Agrippa, his relationship with his childhood sweetheart Bertha and the elixir that gave him an enduring and possibly immortal bodily life. The discussion of the tale revolved around three key questions: the purpose of the narrative, the issue of immortality and the question of love. Our discussion started with a question about the nature and the purpose of the narrative. While clearly a first person narrative, it is not clear to what extent it is a journal, a letter or more generally intended for public rather than private consumption. Comparisons can be drawn between the narrative technique of ‘Mortal Immortal’ and the journal style stories to be found in journals like Blackwoods in the period but also, more directly, to the confessional narratives of Frankenstein (1818) or the found ‘manuscript’ of The Last Man (1826). Each of these comparisons suggests a potentially unknown but implied reader. The question remains, however, of the purpose for which the text was written. Our discussion covered a number of possibilities and highlighted the tension between the reasons expressed in the first and last paragraphs of the tale. I will tell my story, and my reader shall judge for me. I will tell my story, and so contrive to pass some few hours of a long eternity, become so wearisome to me. This emphasis on the dual aims of relating his story for exterior judgement and passing time has been overwritten by the end of the narrative with far more ambitious aims. The emphasis on simply his tale has been overwritten by a desire for monumentalisation, his tale as monument, betraying a thirst both for fame and meaning. Emphasis is placed on the idea of his ‘name’ surviving here but the question consistently in the discussion was to what extent the tale fulfils that function. We receive very little information about Winzy, with Agrippa and Bertha being more important foci of the narrative and receiving through it a form of immortality. Winzy’s name is eclipsed by theirs and his history is empty as the tale contains little information about who he was as an individual. Is the story then an attempt by Winzy to discover himself and a name worth leaving behind? Or does it simply betray the ‘miserable vanity’ of his desire, erasing his individual identity as it attempts to construct it? There is also an interesting overlap between Winzy’s lack of identity and the author’s. The title page tells us this story was written by the ‘writer of Frankenstein’. Mary Shelley’s name is eclipsed by a title as Winzy’s name is eclipsed by a title – the mortal immortal. Our discussion tied this into the discourse on authorship of the time, noting the emphasis on titles rather than names in the cases of, for example, Joanna Baillie and Walter Scott and contrasting it with the emphasis on authorial authority in Wordsworth. Titles, in the case of ‘The Mortal Immortal’ and both its narrator and author, erase names and the individuals behind them. Our discussion moved onto the idea of narratorial control. Winzy writes his own narrative and thus, in a sense, attempts control of his own story. He is, therefore, an unusual case of an immortal exercising agency over their own immortality. We drew parallels throughout with Mary Shelley’s collation and editorship of Percy’s work and the way in she effectively made or created him as an author. His immortality was defined by the nameless mortal. We also compared this desire for narrative control with Shelley’s other works, Frankenstein and The Last Man. In Frankenstein, of course, we hear a melange of voices seeking authorial control. In The Last Man, with its curious narratorial construction of travellers in the 18th century finding a scattered Sybelline prophecy detailing the last days of the last man, we find a helpless lack of control dressed as control. Both strategies can be potentially traced in ‘The Mortal Immortal’. Our discussion, by this point, had branched into the topic of immortality and the obviously negative reflections on immortality represented within Winzy’s account. Immortality is essentially loneliness for Winzy. Despite his marriage he reminds isolated, missing an equal, a partner or someone simply on the same bodily trajectory as himself. Lonely and afraid of death, this very fear drives him from people because while he is fairly sure about the slowness, if not non-existence, of his own decay, he cannot be assured of his immunity to violent or sudden death. He seems driven by a will to exile, similar to that found in Byronic narratives such as ‘Manfred’ and in direct opposition to Lionel’s desperate search for company in The Last Man; beyond Bertha, he makes no attempt to seek any other form of human company or integration with the world. (Throughout I made incessant references to the Highlander movie, which, I maintain, offers an interesting counterpoint: a man in a similar situation who makes all the other choices, including seeking alternate companionship, thus highlighting Winzy’s failure.) In his account, we find a solipsism. His intent focus on his own journey and his attempt to understand himself have cut him off from the greater population. He addresses no other problems or wider issues in his narrative, his is not a global or even a national tale, it is an individual one. His concentration is throughout on his own nature and the nature of his immortality. Like Frankenstein’s creature, he is trying to find out what is human in himself, the mortal in his immortality and in what that consists. Is it in language, reason, literacy, speech, historical consciousness, or emotion, particularly love. If so, he, arguably, retains them all but the question remains of whether his immortality has somehow changed him and robbed him of his humanity along with his mortality. If I survive, my name shall be recorded as one of the most famous among the sons of men; and, my task achieved, I shall adopt more resolute means, and, by scattering and annihilating the atoms that compose my frame, set at liberty the life imprisoned within, and so cruelly prevented from soaring from this dim earth to a sphere more congenial to its immortal essence. He seeks an immortality of fame but more importantly an immortality of the soul. To return to the question of the changes that bodily immortality have essentially wrought within him, we received the answer of ‘damnation’. There is an echo here of a common trend within 18th and 19th tales, from Swift’s Gulliver’s Travels to William Godwin’s St Leon or the vampiric tales of the period, which remained more strongly influenced by Eastern Orthodox theologies: an endless life of the body is damnation of the soul. This is, in part, connected to an ongoing theological debate about the interconnectedness of soul and body. In ‘The Mortal Immortal’ there is clear reference to them as distinct entities and the body as a trap for the soul, separating it from both paradise and salvation. We returned again to the concept of the ‘miserable vanity’ of his account and posited the tie here to the existent tensions in his own concept of immortality. While assured of the worthlessness of a bodily immortality and positing the necessity for a free ‘soul’ immortality dependent on death, he remains unable to leave behind the veneration of earthly immortality. His ‘miserable vanity’ is the vanity of his own attempts to create a form of deformed immortality of whose lack of worth he is all too aware. Concentrating on this phrase ‘miserable vanity’, however, we were brought back to a slightly differing interpretation of its importance, relating it back to Bertha’s own ‘miserable vanity’. As she ages and Winzy does not she becomes obsessed with the physical signs of aging in, as we decried, a particularly gendered way. We tied the text’s focus on Bertha’s fear and anxiety regarding Winzy’s continuing youth and her own aging process back to the biographical context previously discussed of Mary as Percy’s editor. As Percy remained ever young, made immortal by Mary, unable to age as Wordsworth before him had done into a cranky old conservative. Mary, on the other hand, aged beside his eternal youthful memory. Although speculative, this biographical link was of interest in interpreting Mary’s own negative and gendered portrayal of Bertha’s vanity. The views of each reader differed significantly in their reading of Bertha (and her vanity). The question centred around the nature of the love between the two characters and the nature of their relationship. Before getting married, Bertha had mocked Winzy for his unwillingness to ‘face the devil’ to attain the riches necessary to marry and had flirted with Albert, the choice of her benefactress. It was his jealousy that drove Winzy to drink the potion, thinking that it would cure him of his love. This series of events was the roots of many of our questions and differing opinions. We were split between a view of pre-marriage Bertha which was largely positive (feisty, independent, opinionated and truly in love with Winzy but frustrated at the delays) and largely negative (coquettish, inconstant, vain). In taking the first view, we contend that Bertha changed after marriage into someone more insecure, less rebellious, less independent and worried about the value in her aging body. The question remains, however, at which point this occurs. It is possible to suggest that it begins with the onset of aging, however, we also discussed the point of marriage and proposal as the changing point. The event which leads to marriage (Winzy ‘rescuing’ Bertha as she flees from her benefactress) is brought on by the euphoric effects of the elixir. It is worth noting that we also differed in our interpretation of this event - was Bertha motivated by love at all or a desire to flee and to find refuge (creepily) in his ‘mother’s cot.’ To what extent this relationship was ever about love and to what to what extent this love was equal on both sides is unclear and after this point becomes increasingly murky. The exact effect of the elixir is unclear but Winzt is effectively on drugs, whose exact effect and potency are unclear, and there is also the question of the soul deep changes rendered by the very fact of his immortality. There is, however, an automatic imbalance created in the relationship after the elixir is imbibed– the root, perhaps, of Bertha’s personality change. If, of course, you followed the second reading of Bertha, there is little change and only a consummation of her earlier vanity and concentration on the physical. (Reading against Highlander and its treatment of the relationship tends to push the second reading! )There is an ironic juxtaposition between Winzy’s bodily inability to escape the physical and Bertha’s spiritual inability to escape it – just who exactly is damned by it is, perhaps, unclear. As the above comment suggests, there is an investigation in the tale of the value of the physical and, more specifically, beauty. Our conversation drew us back here to Chaucer and a comparison with The Wife of Bath in which the question is posited of whether it is better to be young and beautiful forever or loyal. Shelley, perhaps influenced by Chaucer’s tale, of which she was aware, offers a reply of sorts in ‘The Mortal Immortal’ but one which appears to defy the possibility of a correct answer. We also linked it back to Percy Shelley’s ‘Alastor’ and the question of who we love: Is it the immortal ideal which exists nowhere but in our own minds or the other person, in all their reality, who can never be perfect enough for us. Bertha, at different times in the tale, represents both. In this way, she also reflects Winzy’s changing conception of immortality itself. The images used to convey how he views Bertha (the sparkle in her eyes, the colour of her cheeks) echoes the terminology used in describing the elixir itself. Ironically, he views the object of his love in the same way as the elixir he looked to to cure him of his love. This ambiguous relationship between love and love’s object and the elixir from the very beginning highlights the tensions between immortality and love. Without death life isn’t precious and the question is raised if the preciousness of love fades with it. Our discussion ended with our investigation of this question and the relationship between love and life. Returning to our earlier questions of the nature of life and the importance of ‘love’ to the definition of human, we discussed whether the elixir made love possible or rather impossible. Is Agrippa’s seemingly deceptive description of the elixir as a cure for love actually the ultimate truth of the potion? Love recurs in Western definitions of humanity from biblical teachings about the importance of ‘love’ both to God (who is love) and to humanity (made in the image of God) to Percy Shelley’s synopsis of human history in Prometheus Unbound. Love both defines us as human and provides the basis of our immortality – whether in the ‘immortal’ loves of an Eloise and Abelard or in the relationship of love necessary to the salvation of our souls. Love for Winzy is arguably something made possible by the euphoria of early immortality but it cannot survive when the landmarks of mortality are removed, which causes duty (Winzy) and jealousy (Bertha) take the place of authenticity. Alternatively, we could argue that in taking the elixir Winzy rendered himself incapable of human love, which depends on the mortality of both its partners. Either its preciousness is lost along with life’s own or the love of an immortal being cannot be that of a mortal heart. And yet, it is his love story that fills his narrative as if he, half blind and still seeking the nature of both humanity and immortality, seeks to make his love story his only true chance of both. It’s never too late to get involved in the discussion. You can access the story here and we welcome comments and further discourse. Romantic Circles Pedagogies Spring Reading Group continues its gothic streak and will discuss Mary Shelley's immortal short story "The Mortal Immortal"! We will meet next Thursday, April 19th, at 4pm ET via Zoom. Many can attest that our first meeting was lively, great fun, and participants learned a lot from each other. Encore! Those who RSVP will receive an email later this week with instructions for joining the Zoom videoconference chat. We hope you will join us. Looking for a copy of the text? There is an electronic edition on Romantic Circles edited by Michael Eberle-Sinatra. Romantic Circles Pedagogies is looking to assemble a porous group of scholars at all levels who want to discuss canonical and emerging texts -- an open, generous, and collegial community of readers and teachers. Each term, RC Pedagogies will host a virtual reading group on a predetermined text at a set date/time via video-chat on Zoom, an online video-conferencing system (free and easy to use). We envision these events as broadly pedagogical moments for graduate students and established scholars alike who want to increase their own knowledge of the field and/or discover new ways to teach the work. The conversation will welcome those who are reading the text for the first time as well as those who have published extensively on it. Participants will have the chance to discuss the reading with one another, offer interpretations, and ask questions of the group for about an hour. Each reading group meeting will be kicked-off and mediated by a moderator. Meetings will be lively, light, open, inclusive, friendly, and hopefully enjoyable occasions for scholars at all stages to think about and converse on the selected text. They will not feature a prepared lecture by the moderator or any invited guest speaker. Our goal is to encourage debate and inquiry among all participants. Our first meeting will take place on January 25 at 4pm ET (1pm PT). We will discuss “The Bride of the Greek Isle” (Felicia Hemans). Texts and some dates for 2018 are listed below. We welcome suggestions for future readings. See both blog posts for an account of the public scandal Shelley's comment provoked. On June 14 and 15, the Brocher Foundation, Arizona State University, Duke University, and the University of Lausanne will host “Frankenstein’s Shadow,” a symposium in Geneva, Switzerland to commemorate the origin of Frankenstein and assess its influence in different times and cultures. The Center for Science and Imagination at Arizona State University is accepting applications to sponsor one scholar to participate in the event. All allowable, workshop-related travel expenses (e.g., economy round-trip airfare, 2-3 nights in the symposium hotel, transfers, and meals) will be covered. Additionally, all the pertinent information, including a link to apply, can be found at http://frankenstein.asu.edu/apply/. As with our earlier release of the Frankenstein manuscripts, these manuscripts all appear as high quality page images accompanied by full transcriptions, and they are encoded in a schema based upon the Text Encoding Initiative’s guidelines for “Representation of Primary Resources,” enabling researchers, editors, and students to pursue a variety of scholarly investigations. Our encoding captures important aspects of the composition process, tracing the revisionary evolution of primary manuscripts and enabling users to see and search for additions, deletions, substitutions, retracings, insertions, transpositions, shifts in hand, displacements, paratextual notes, and other variables related to the composition process. For this release, the S-GA team invested in refining the design of the site to improve users’ experience of navigating the rich contents of the Archive. Most notably, the contents of S-GA can all be accessed by Manuscript (with page images ordered by their sequence in the manuscript), or by Work (with page images ordered by their linear sequence in the work, e.g., Acts and scenes). The Frankenstein manuscript page images have been refactored so that they can be accessed in all of the complicated arrangements and rearrangements through which they have descended to us over time. The notebooks just published also contain fair copies of his lyric poems “Ode to Heaven” and “Misery.—A Fragment,” as well as his draft translation of Plato’s Ion. 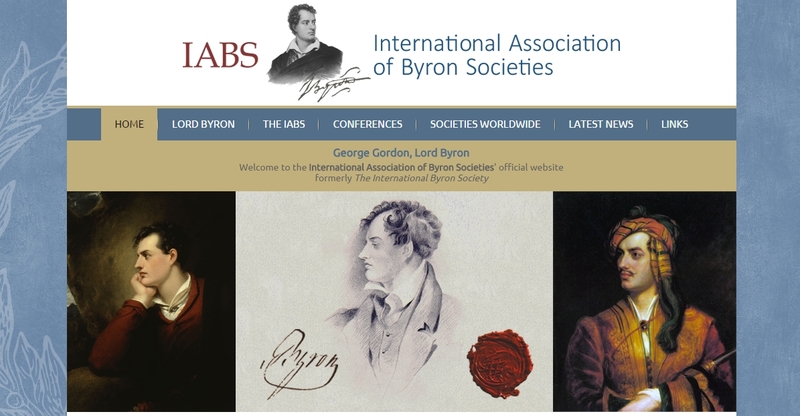 The International Association of Byron Societies (IABS) has unveiled a new Web site, available at http://www.internationalassociationofbyronsocieties.org/. Along with a fresh design, the site contains information and links about Lord Byron, the IABS' member organizations, conference announcements, and news. On the occasion of the bicentenary of the Battle of Waterloo, the Centre for Reception Studies (http://www.receptionstudies.be) of the KU Leuven (University of Leuven) organizes an international conference on "The Transnational Reception of Waterloo in the 19th Century" on 18 and 19 June 2015 (200 years to the day of the Battle). All further details and the full call for papers can be found on the conference website: http://www.waterloo19.be. Please send proposals (max. 250 words) for 20-minute papers to tom.toremans@kuleuven.be before 20 March 2015. Successful applicants will be notified by 15 April 2015.
legacies of Romanticism in contemporary art. than two pages) by February 2, 2015, to romanticism2015@gmail.com. and the Yale Student Colloquia Fund.